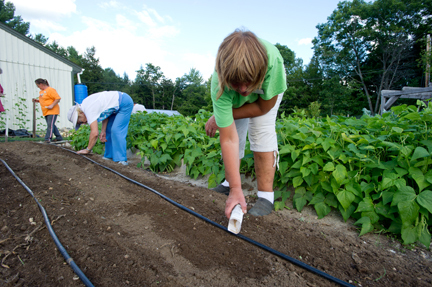 Have a plan for planting your 2012 vegetable garden. Consider sowing some seeds and transplants 2-3 weeks before the traditional Memorial Day weekend. Some vegetables are not affected by frosts. See Vegetable Gardening ~ Keep Your Garden Growing ~ Plant from Spring to Fall. Prepare garden spaces for this year’s planting. Consider raised beds, containers, and new gardens for fruits, vegetables, herbs, flowers, trees, and shrubs. Addition of organic matter into the soil will help water- and nutrient-holding capacity of your garden soil. Repair or replace the sides and ends of wooden raised beds as needed. Try a new vegetable variety this year, like conical cabbage (early fresh cabbage) or something your family enjoys eating. Consider growing perennial food crops, like rhubarb, asparagus, blueberries, apples, strawberries, and raspberries. These crops take planning and site preparation. Pick out a spot this year to prepare the soil for the planting next spring. 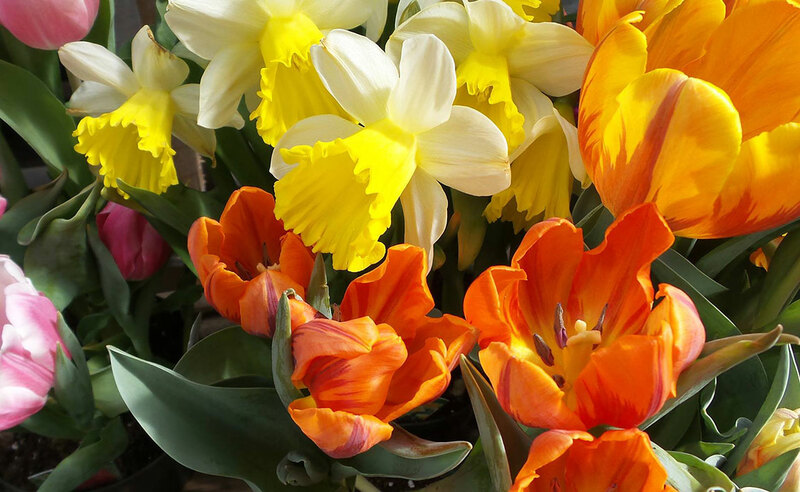 Visit your favorite garden center to learn about new and different plants, products, and tools. Ask the owner or an employee about what’s new. Review safety rules for using your lawn mower. For more information, visit University of Arkansas Cooperative Extension Service online publications listing and search for “Lawn Mower Safety” or “FSA1005”. You will be asked for your zip code. Consider using mulches on your perennial beds and plantings to prevent and control weeds. Improve beds this month by edging, removing weeds, and adding fresh mulch. If you use any type of pesticides (organic or synthetic) in your yard or gardens, be sure to purchase the appropriate personal protective equipment (PPE). Specific protective gear such as eye protection, respirators, gloves, and clothing will be specified on the pesticide label. If you have not done so already, start a compost pile. Pick a site that is convenient and accessible. For more information on the essentials of home composting see Bulletin #1143, Home Composting. 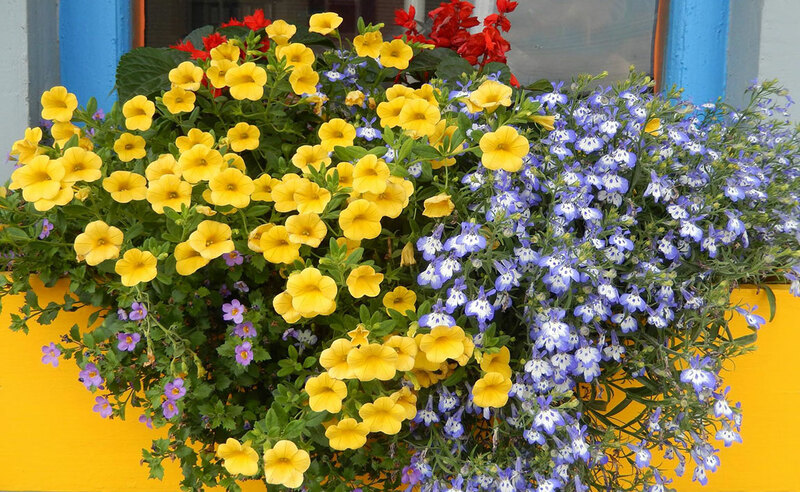 Add more color in your yard. 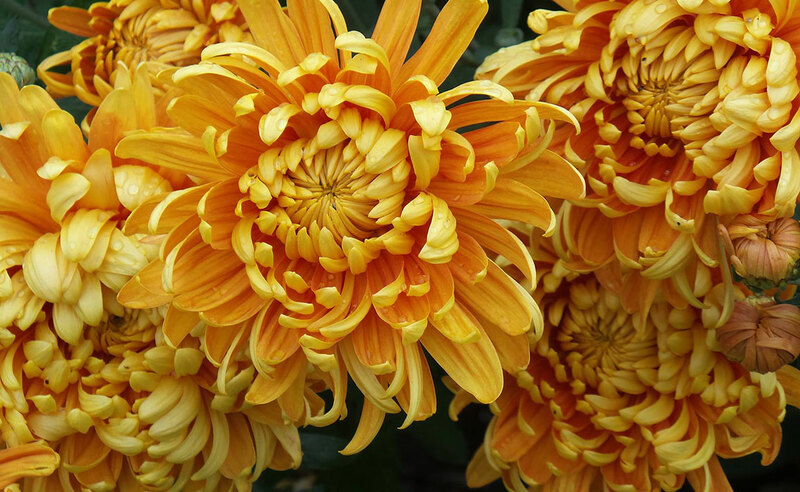 For ideas on flowering trees, shrubs, and flowers, visit your local garden center or nursery. Determine the right plant for the right place. 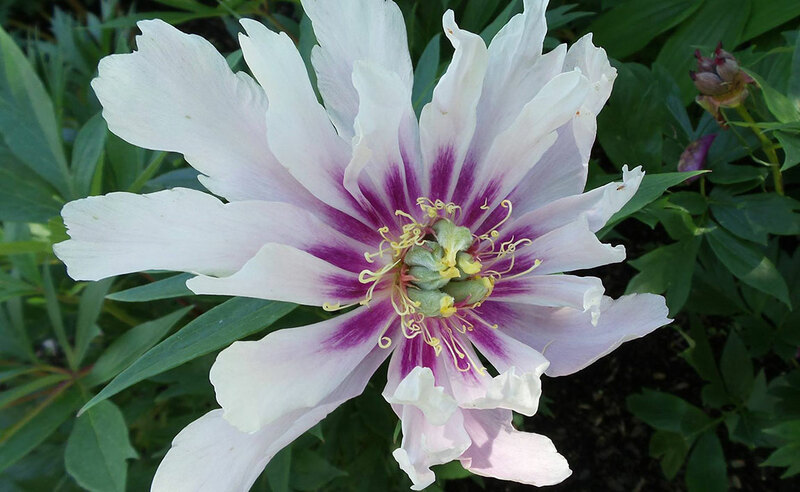 See “Right Plant, Right Place” — A Plant Selection Guide for Managed Landscapes from UMass Extension. 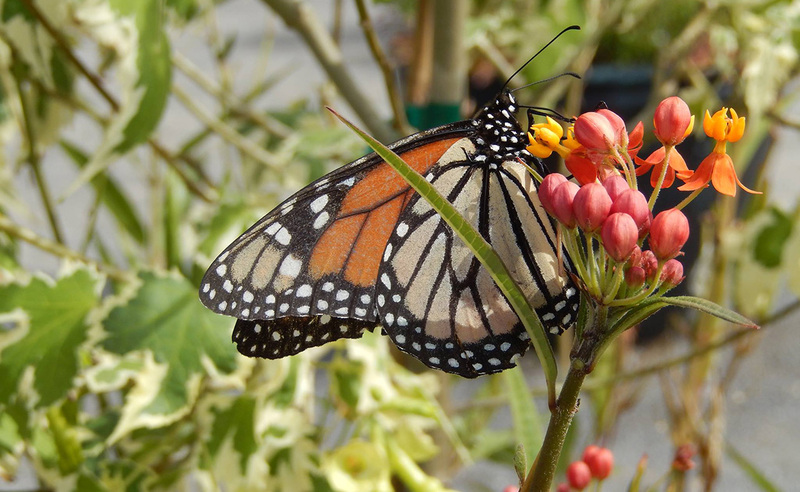 If you have a butterfly lover in your household, learn how to attract butterflies to your yard. 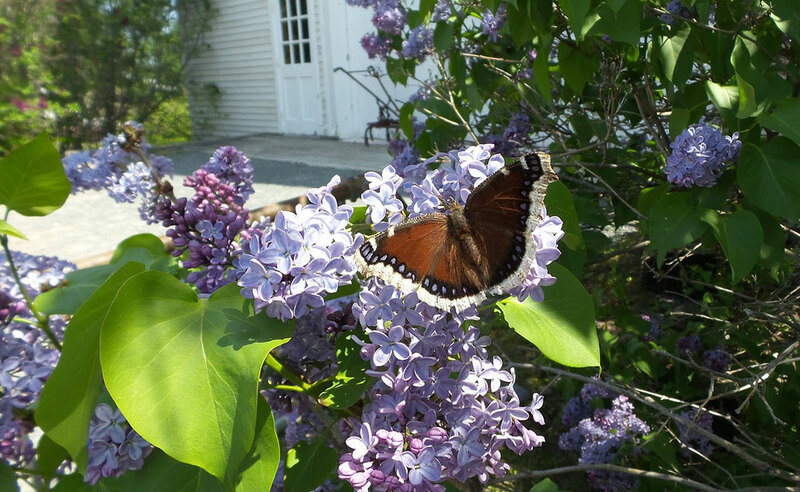 For more information, see Bulletin #7151, Landscaping for Butterflies in Maine. Be aware of invasive insects to Maine. For more information, see Invasive Threats to Maine’s Forests and Trees from the Maine Forest Service. By Lauren St Germain, Home Horticulture Coordinator, University of Maine Cooperative Extension, Franklin County, lauren.stgermain@maine.edu. Every spring, gardeners are faced with the challenge to determine when to plant seeds and seedlings in the ground. 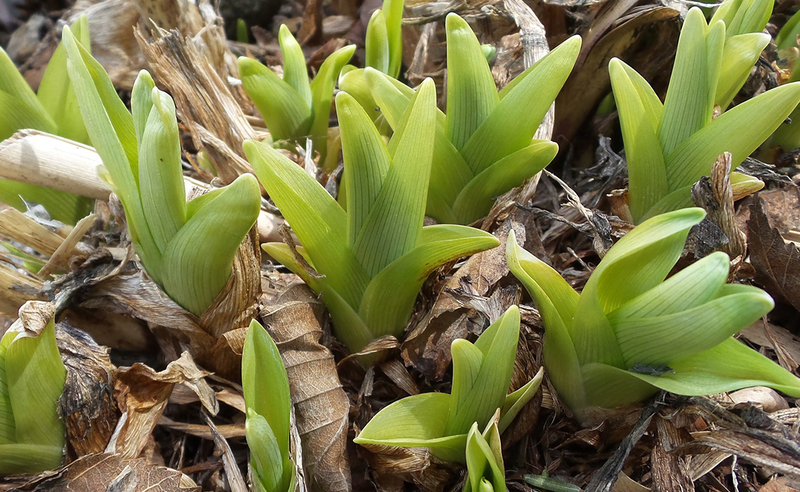 Factors most gardeners consider are average day and night time temperatures, the date of the last expected frost, how early crops were planted the year before, how wet the soil is, or the date of the next full moon. One important factor that is often not considered is soil temperature. Soil temperature has a strong influence on when seeds will germinate and on performance of transplanted seedlings. Seeds planted in soil that is too cold or even too hot may have poor germination. The result is wasted time, money, and a lot of frustration. Some seeds planted in soil that is too cold are also more susceptible to soil-borne diseases and insects that will feed on them. Vegetable seedlings, if planted in cold soil, have difficulty absorbing nutrients, have very slow growth and root development, and are likely to develop diseases like blossom end rot. There are minimum, optimum, and maximum temperatures at which different vegetable seeds will germinate. By using Soil Temperature Conditions for Vegetable Seed Germination by the Alabama Cooperative Extension System as a guide, gardeners will not only have better success with seed germination, but can also space plantings over time to gain a longer growing season and hopefully greater yields. For example, radish seeds can be planted when the soil is a minimum of 40º F. It could be a month or more after that before soil temperatures reach the minimum of 60º F for pumpkin seeds. Ideal soil temperatures for seedlings are 60º F for tomatoes, cucumbers, snap beans; 70º F for peppers, watermelons, and squash; and 75º F for cantaloupe and sweet potatoes. This is not to say that plants will not live if planted at lower temperatures, but there will be higher risk for complications. To measure the soil temperature for seeds, insert a soil thermometer around 2 inches deep into the soil. Use the average temperature over the course of 3 days as a guide to whether or not to plant seeds. For seedlings, measure a little deeper down to 4 or 5 inches. Tracking soil temperature is a simple, inexpensive addition to any garden planning ritual. Soil thermometers can be found at most garden supply stores, and generally cost less than ten dollars. By David Rocque, State Soil Scientist, Maine Department of Agriculture, david.rocque@maine.gov. Most septic system disposal fields designed since 1974 are installed either partly or completely above the original ground surface. This is because most of our soils in Maine have a shallow seasonal groundwater table, hardpan and/or bedrock. The bottom of the disposal field must be elevated above any “limiting factor” in order for the waste water to drain into the soil and be renovated. For the most part, fill material over the stone or other components (plastic or concrete chambers, fabric wrapped pipe, geo-textile sand filters, etc. ), which comprise the main body of the disposal field is usually 8” – 12” deep. Generally, only the top 4” of this fill material has silt or clay and organic matter in it. The lower part of this fill is supposed to be a gravelly coarse sand material. This is to allow for the free exchange of air into the disposal field so that microbes can quickly attack and renovate the waste water. Below the fill material, and immediately above the stone or other disposal field components is a layer of compressed hay or filter fabric. The purpose of this compressed hay or filter fabric is to prevent fine soil particles from the fill material above entering voids in the stone or other devices. The stone or other devices main function is to provide storage capacity for the wastewater, which is usually generated faster than the soil can absorb it (people usually generate most of the waste water in the morning before work and school and in the evening after coming home from work). If the voids in the stone or other devices become filled with soil, they will not be able to store the waste water causing a septic system failure. The most important reason you should not create a vegetable garden above or immediately adjacent to a septic system disposal field is because of the potential for the plants to become contaminated with human pathogens. The vegetable garden plants will send roots down in search of water and nutrients; neither of which will be found in the gravelly sand fill material. If the roots come in contact with waste water, they can take up pathogens such as viruses which can then infect the person eating the plants. In a brand new septic system disposal field, the waste water level in the disposal field is usually quite low. Over time, however, as the disposal field matures, ponding of waste water can be expected. This is due to the partial clogging of the soil pores by particles escaping from the septic tank and the living and dead bodies of microorganisms. The thicker this clogging layer is the higher in the disposal field the waste water level will be. The waste water level will also rise during heavy use events or as a family grows up and/or adds more members. Eventually, the waste water levels in a disposal field will likely be high enough for even shallow rooted plants to come in contact with it. Water (including waste water) will “wick” up into soil due to capillary attraction. If waste water rises high enough in the disposal field to come in contact with the fill material on top of it, capillary attraction could cause the waste water to wick up to as high as 18” above, depending on the texture of the fill. This is also why no vegetable garden should be placed on a disposal field fill extension, especially near the disposal field. There may be no wicking up to the top of the disposal field or fill extension material at first but it may occur as the disposal field matures. Generally, the soil over the top of a septic system disposal field is very droughty, particularly soon after the disposal field is installed, and therefore not suitable for the growing of a vegetable garden. This would create the need for watering of the plants in order for them to prosper. Adding water to the top of a disposal field, particularly if the disposal field was only marginally functional, could cause it to fail. Roto-tilling the top of a disposal field could result in damage to the compressed hay or filter fabric. If the compressed hay or filter fabric is damaged, it could allow soil particles to migrate down into the stone or other devices in the disposal field reducing the waste water holding capacity. Placing additional fill over the top of a disposal field, in order to create a safe zone for vegetable plants to grow is also not a good idea. The additional fill material might “suffocate” the disposal field by making it more difficult for the free exchange of air. An anaerobic disposal field is much more likely to clog up and fail than an aerobic one. In addition, placing the additional fill material on the disposal system could result in damage to disposal field components by heavy equipment. 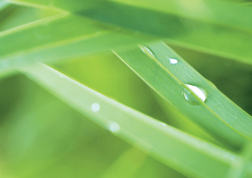 The most suitable plants to grow on top of septic system disposal fields and fill extensions is grass. It is also permissible to grow flowers, but only if the soil is not roto-tilled and minimal watering is done. No plants that have woody roots should be planted on the disposal field or fill extensions since the roots might clog up pipes and other devices in the disposal field. If you do not want vegetation to grow over your disposal field, it is permissible to cover the bare soil with bark mulch. By Frank S. Wertheim, Extension Educator, University of Maine Cooperative Extension, York County, frank.wertheim@maine.edu. Five step fertilizer and pesticide programs, irrigation, frequent mowing, lawn care services – the American lawn has become an icon and status symbol across the country. 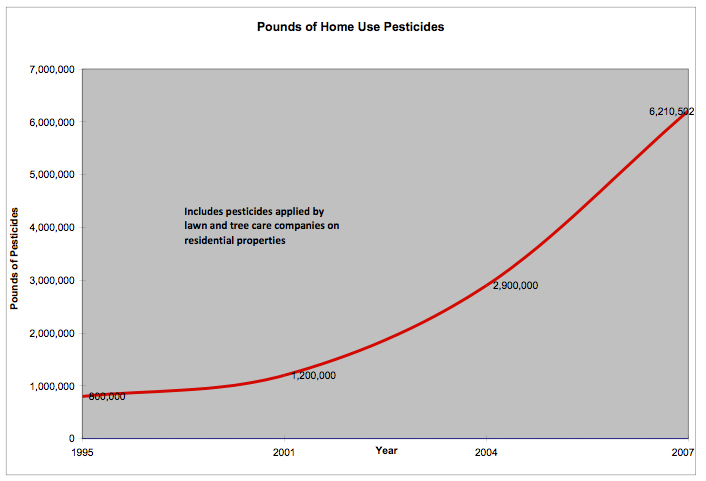 Along with this explosion in the lawn care industry, there has also been an increase in use by Maine home gardeners in the pounds of active pesticide ingredients, from 800,000 pounds in 1995, to 6.2 million pounds in 2007 – an almost 8-fold increase in 12 years (chart below). Excessive fertilization can result in leaching of nitrates, which can end up in toxic levels in fresh groundwater sources and/or be a threat to groundwater quality and coastal estuarine environments. Soil levels of phosphorus from lawn fertilizers can become excessive, and if spread too close or from erosion into fresh water bodies, can result in algae blooms causing pond and lake water quality degradation. Click on the chart to view an enlargement. Fortunately, there has also been a rising interest in alternatives to intensive lawn management practices. 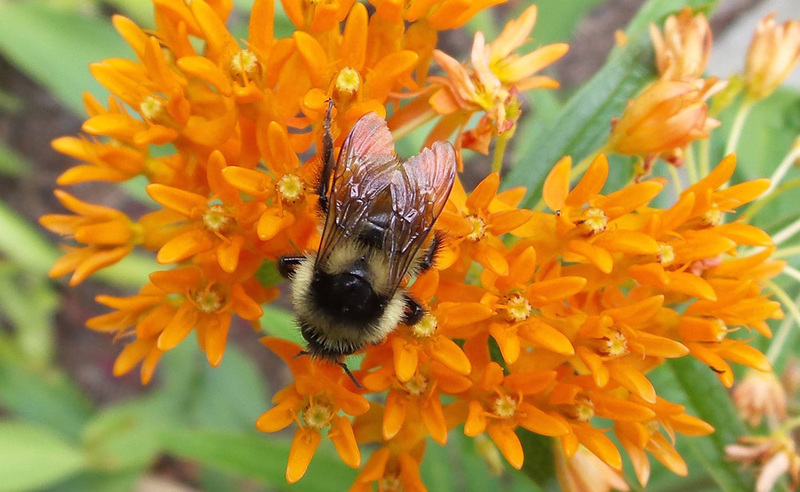 Programs like the Maine Yardscaping Coalition are dedicated to promoting low input lawns and garden practices to reduce fertilizer and pesticide inputs and recommend the right plant for the right place. Visit www.yardscaping.org. The good news is there are some pretty simple steps, which while they do take some research and labor, result in healthy lush lawns with a minimal or no fertilizer and pesticide inputs. For more information, see Bulletin #2166 Steps to a Low Input, Healthy Lawn. Through education and best practices we can have our cake and eat it too – healthy, vigorous lawns and positive impacts on our environment.